Recognizing behavior patterns in pets is a very important part of our job as a member of the health care team. Being able to recognize the body language that a dog or cat demonstrates will allow you to react in the appropriate manner. The following discussion involves interpretation of actions pets make. 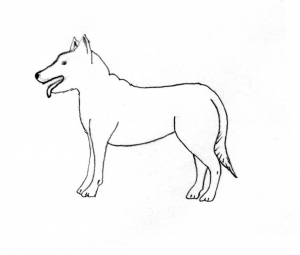 This interpretation involves very close detailed observation of the stance, posture and movements of a pet. The study of species-specific behavior is called ethology. 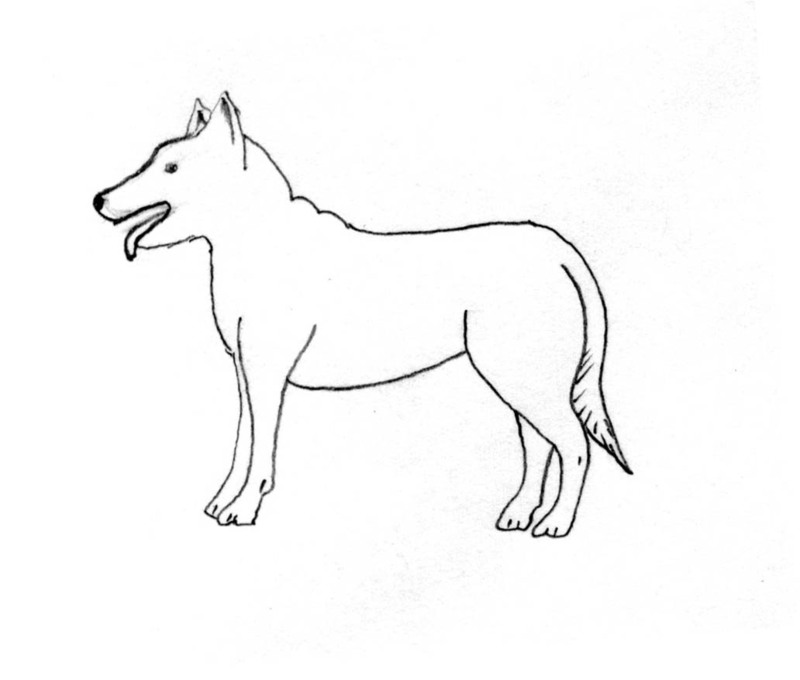 DESCRIPTION: The body is relaxed with head held high, ears erect and forward. The mouth may be open or closed with the tongue hanging out or pulled in. The tail hangs down loosely from the body. 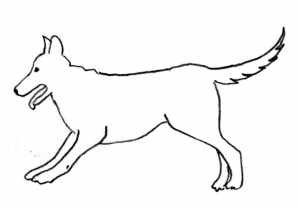 ACTION: Move slowly towards the dog and note any changes in behavior. 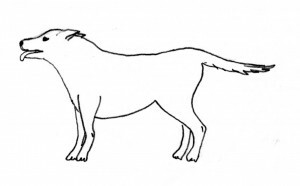 DESCRIPTION: The ears are erect and the mouth is closed. 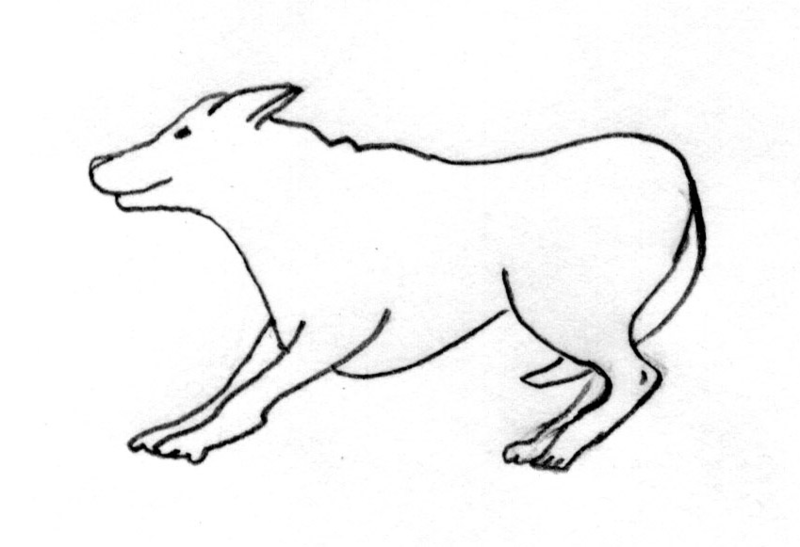 The tail is held out straight in continuation of the body axis. Hackles are down or may be slightly raised. DESCRIPTION: Ears are erect. The nose may be wrinkled when the teeth are bared and the corners of the mouth are drawn back more or less in a snarl. The hackles are raised on the neck, back, and at the base of the tail. 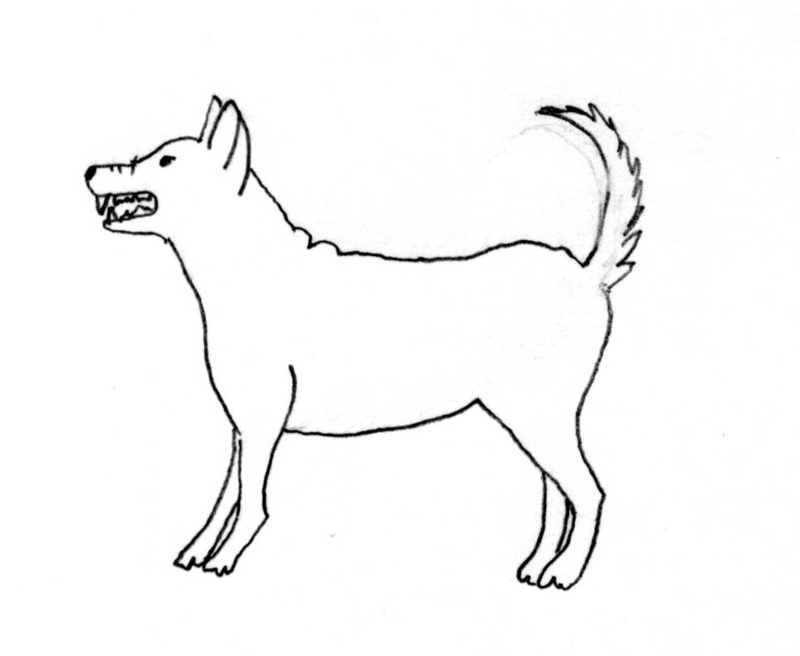 While the dog may be growling, his upright tail may be wagging swiftly. ACTION: This dog is ready to attack. Do not approach any closer. Talk to him softly and evenly, perhaps even back off a little. Avoid looking him in the eyes since this is considered threatening. 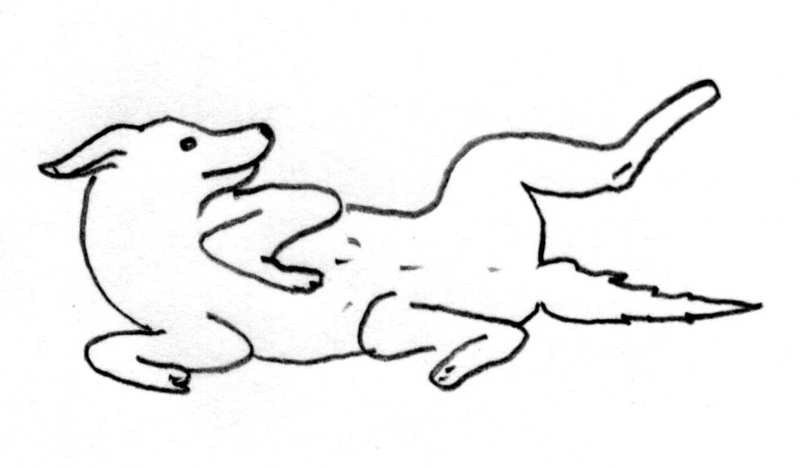 Do not corner this dog; instead, give him room to move. If this approach fails and time is running out, try to distract his attention and see if the mood changes. If necessary, move in quickly, grab him from the top and behind his neck, pin him to the ground, and growl. If he submits and accepts you as the dominant “dog”, you can now talk softly again and groom him so that he will lose his fear of you. It is unusual for a dog away from his home to exhibit such behavior and it requires some expertise to dominate such a dog. DESCRIPTION: The ears are laid back. The lips are drawn back in a semi-snarl and the nose may be wrinkled while the dog is growling. 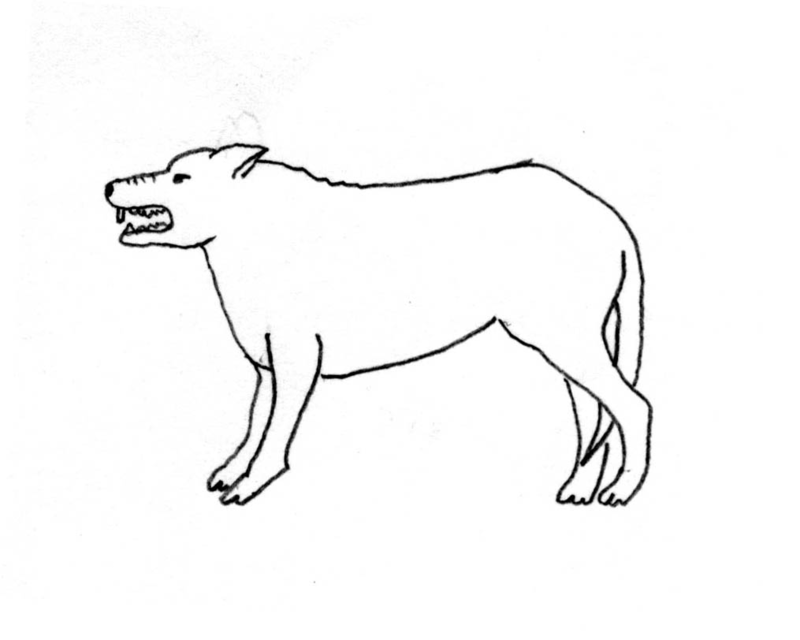 The growl often changes to a whine. 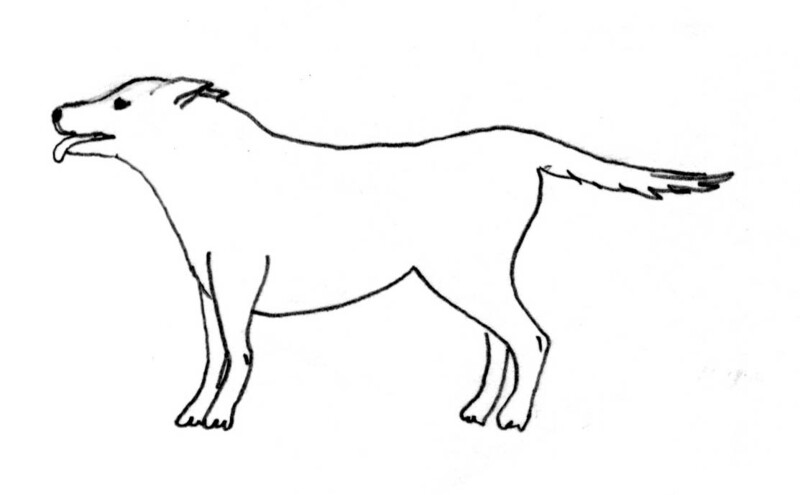 The hackles may still be raised with the tail hanging down or slightly tucked between the legs. The dog may “anxiously” lick his lips or nose. ACTION: The animal needs to be calmed down. There should be no need to dominate him, since he is already showing signs of submission (ears back and tail tucked in). Grooming may help at this time. 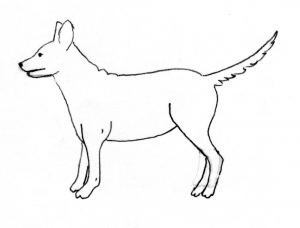 DESCRIPTION: Ears are pulled back loosely, mouth is wide open, tail up and wagging, dog is jumping up and trying to lick your face. ACTION: Jumping can be avoided by you kneeling in front of the dog if he is large, or by picking him up if he is small, so he can lick the face. Pet and groom him and talk to him. This is the way dogs greet each other. ACTION: Respond in a friendly way. To solicit play, jump up and down in front of the dog to initiate his behavior. 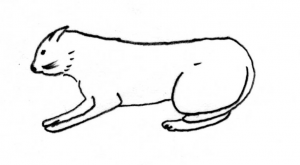 DESCRIPTION:The body is very low, the back may be hunched with the chin on the ground, the ears are back and the corners of the mouth are drawn back (the submissive grin). The tail is tucked between the legs. 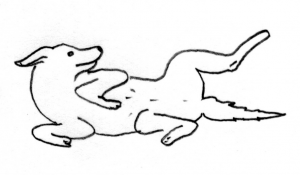 The dog may lie down on his belly or roll over on his back, exposing the underside; he may even urinate. ACTION: This dog needs to be encouraged to play, to get up and walk around. Talk to him, groom him. There is no need to dominate or frighten him in any way. 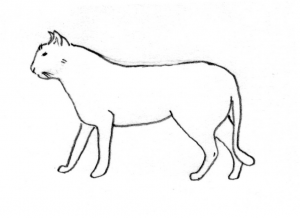 DESCRIPTION: The cat may be standing or lying down. 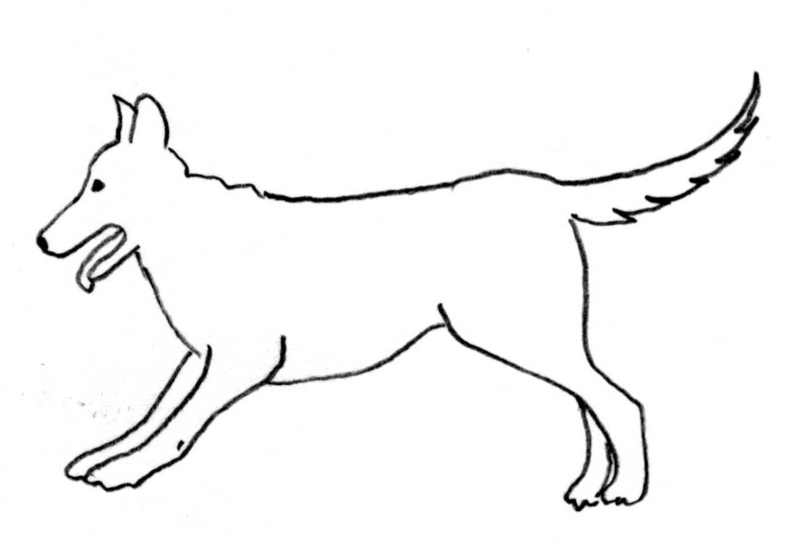 The head is held up, ears up, mouth closed or opened, fur is smooth, tail is hanging down loosely or lying on the ground. The animal may look around or at nothing in particular. ACTION: Move slowly towards the cat and observe any changes in behavior. 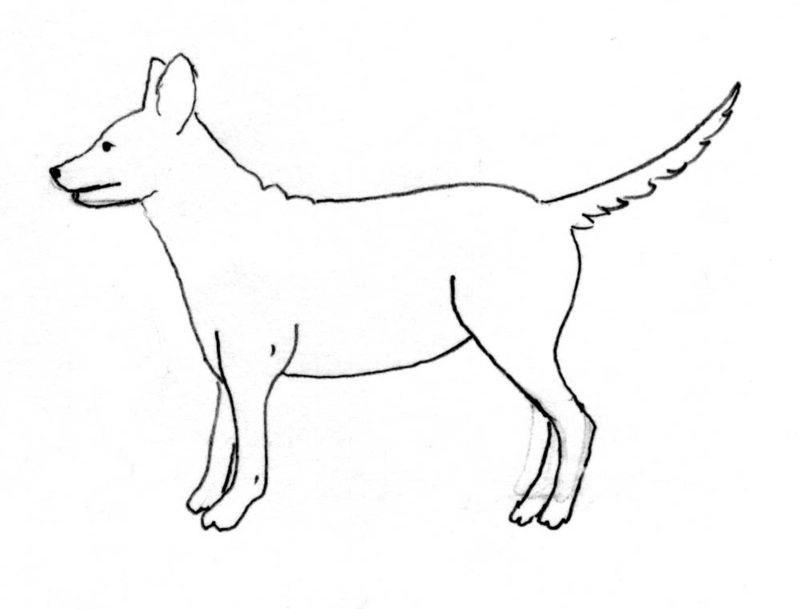 DESCRIPTION: The body is more rigid with the head erect and ears up. 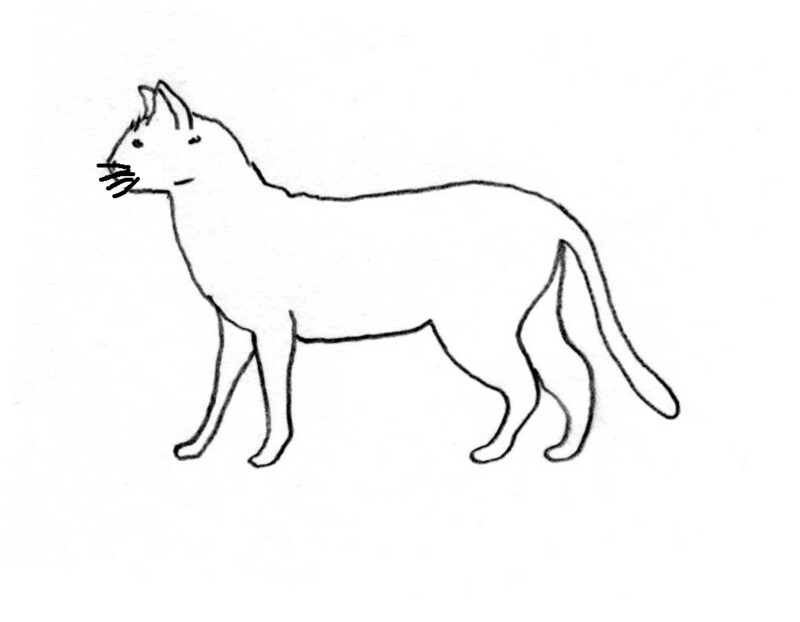 The mouth is usually closed with the whiskers pointing forward. The tail is hanging down, partly raised and possibly twitching. 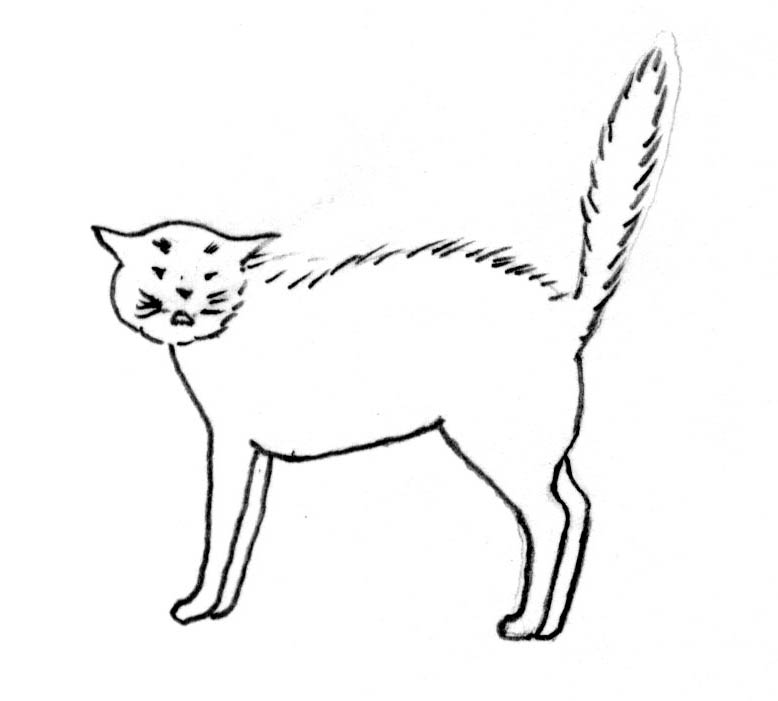 ACTION: If the cat is orienting towards you, call him, approach slowly and groom him around the chin and neck. Note any changes in behavior. Purring may occur if he is relaxed with you. 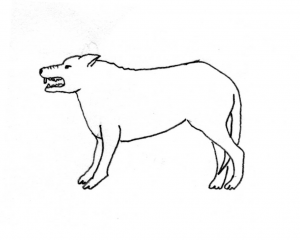 DESCRIPTION: The body is humped and usually stiff-legged. 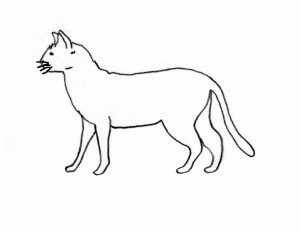 The ears are sunk towards the side of the head, the pupils contract, and the mouth is open slightly to expose the teeth and the cat may excitedly hiss, growl, or spit. There is piloerection of the fur all along the upper part of the body. 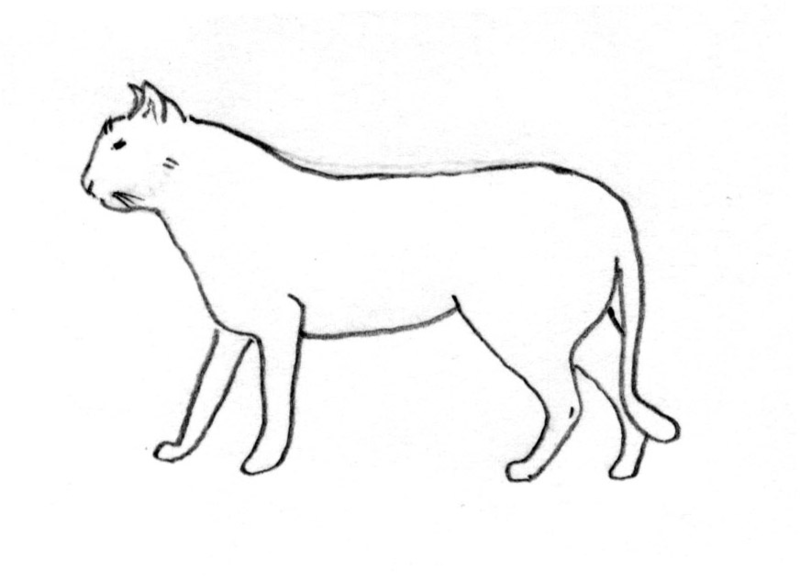 The tail may be held straight up (rarely) or curved away from the body and down (not shown) with the cat turning to face his side to the object being threatened. When he is extremely agitated, the tail may whip back and forth swiftly prior to pouncing or attacking. 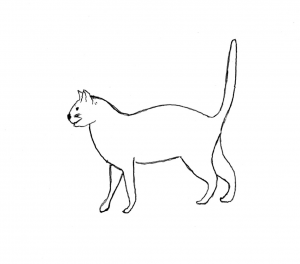 This cat may retain the posture and lash out with its front claws in quick jabs. The cat may even rush the object being threatened if he does not succeed in intimidating the object. ACTION: The cat in this mood is very difficult to handle. His mood may be changed by removing the cause of the threat. The cat is cornered and confined with a towel or leather glove and grasped by the back of the neck. Once firmly grasped the cat will offer no further resistance but will escape at the first opportunity. 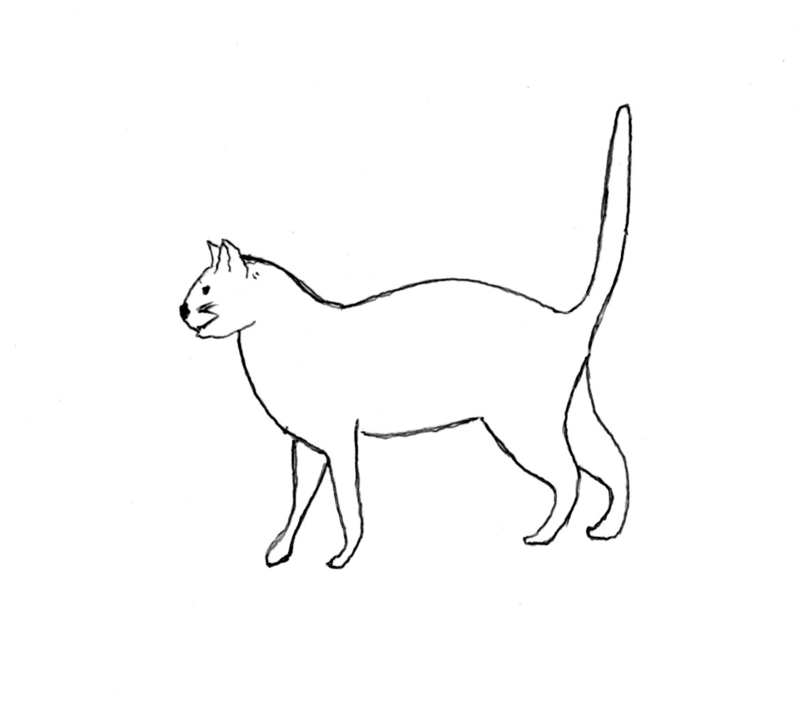 DESCRIPTION: The cat may crouch down, fully extending his length on the side or back, ready to strike with exposed claws, although not actually striking – just feinting. The ears sink in a close fold to the side of the head, the eyes slit, and pupils dilate, while the mouth is pulled back fully to display fangs with hissing and screaming. ACTION: Since this cat needs calming down, move slowly, all the while talking softly so you can try to groom him. He should relax slowly. held low to the ground and the tail held tightly to the body. 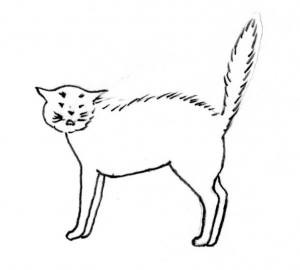 If the cat avoids eye contact with you, this can indicate submissive behavior. Normally the cat tries to move away from you. ACTION: Try to reassure the cat by using the previous methods. you, tilting it slightly. This cat may or may not purr. ACTION: Respond by grooming the cat’s chin and neck region while speaking in a reassuring manner.